About 600 million years ago, life on Earth was pretty much just a homogeneous bunch of simple, soft-bodied species. But in an evolutionary blink of an eye, that all changed. A longstanding geological mystery could explain why our distant ancestors suddenly developed skeletons. In less than a hundred million years, life on Earth shifted away from these simple organisms to creatures with shells and bones. The emergence of the first skeletons helped drive the massive increase in biodiversity and the emergence of much more complex multicellular life. This great shift is known as the Cambrian Explosion, and it's arguably the most dramatic biological event since the first emergence of life itself. Unfortunately, the geological record tends to obscure what really happened during the Cambrian Explosion... or so we thought. There's a bizarre discontinuity between the sedimentary rocks of the Cambrian and the much more ancient igneous and metamorphic rocks that lie beneath them. It's as though millions of years worth of rock formations just up and vanished from the geological record, leaving behind a stark boundary between the ancient and more recent rocks. This phenomenon has the rather awesome name of the Great Unconformity. 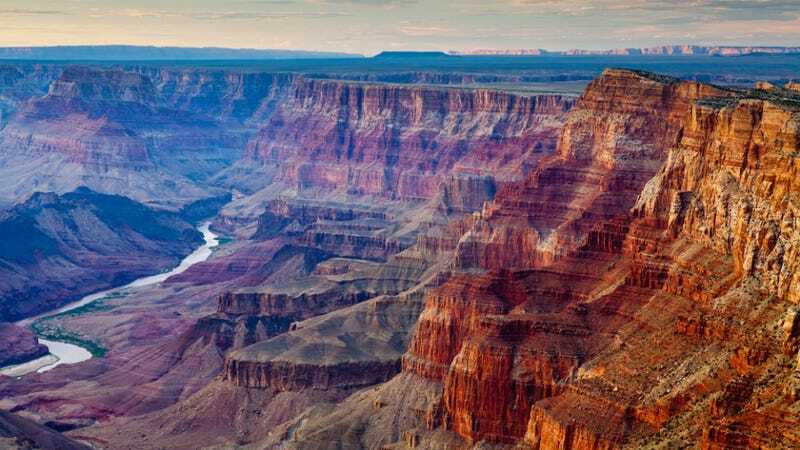 The discontinuity is visible in many of the world's great geological formations, including the Grand Canyon, and indeed it was there in 1869 that geologist John Wesley Powell first discovered and described the phenomenon. No less a luminary than Charles Darwin — and many of his successors — wrestled with the Great Unconformity in an attempt to figure out just what it might be hiding about Earth's deep history and the development of life. Now, geoscientists Shanan Peters of the University of Wisconsin and Robert Gaines of Pomona College think they have the answer. They know what caused the Great Unconformity — and as a pretty great added bonus, they can also use this to explain just why biodiversity skyrocketed during the Cambrian Explosion. According to Gaines, they realized any event dramatic enough to so severely alter the rock record must also have had a major effect on the oceans. And as we know from fossils, this is the precise time species were, for reasons unknown, developing skeletons and diversifying wildly. "We're proposing a triggering mechanism for the Cambrian explosion. Our hypothesis is that biomineralization evolved as a biogeochemical response to an increased influx of continental weathering products during the last stages in the formation of the Great Unconformity." So just what does that mean? Well, biomineralization — the development of shells and bones — would have been a way for organisms to deal with the influx of materials from eroded rocks. We know that the Cambrian world was covered by shallow seas that advanced and receded several times, in each instance eroding away first surface rocks and then the underlying layer of crustal rocks. It's this crustal rock layer that more or less vanished from the geological record, forming the Great Unconformity. The exposure to air and water would have released all sorts of ions in the ocean, including those of calcium, iron, potassium, and silica. These ions would have made their way into the ocean and tilting its chemistry so that it was more toxic. Specifically, the oceans would have become more alkaline — the opposite but equally unpleasant state to the increased acidification the oceans are currently undergoing. This alkaline increase would have upset the careful balance of these ions in the bodies of Cambrian organisms. One of the best ways to get rid of all these ions would have been to actually make use of them, and the simplest was to accomplish that was to start forming biominerals. Raines and Peters argue that it's no coincidence the time of the Great Unconformity is when we first see the simultaneous emergence of biominerals like calcium phosphate, which forms our bones and teeth, and calcium carbonate, which makes up the shells of invertebrates. The researchers also point out the strangeness of these biominerals emerging about 300 million years after the first emergence of relatively complex animals. If the biosphere got along so well without bones and shells for so long, something big must have happened to suddenly make them essential. And once species developed these biominerals, they never looked back, sparking major innovations in natural protection, stability, and most excitingly, predatory ability, thanks to the emergence of bony things like teeth and claws. If these results hold up, then the Great Unconformity, an event Charles Darwin considered perhaps the most mysterious in the entire geological record, has just offered profound revelations about the emergence of complex life. This definitely shouldn't be taken as an endorsement of making the oceans more toxic, but it's a powerful reminder of the fact that more sophisticated species — including, eventually, us — don't generally evolve unless they're forced to endure potentially cataclysmic hardships first. Via Nature. Images by Keneva Photography and MarcelClemens, via Shutterstock.